It’s just approaching 10 games in the season but I’m shocked. I mean I really can’t believe that this ranking is true. I was dreading this season for 2 reasons. First, I thought the Habs would be in the basement for another season. Secondly, the Leaf fans would be drooling from the great play and record of the Leafs. So far the Leafs are doing well but so are the Habs – can’t believe it. If you look at the record, while the Leafs are scoring lots of goals the Habs are keeping the puck out of their net. If you can’t keep the puck out of your net it won’t matter if you can score. So that’s my only comment – let’s see what happens at the half point mark of the season. 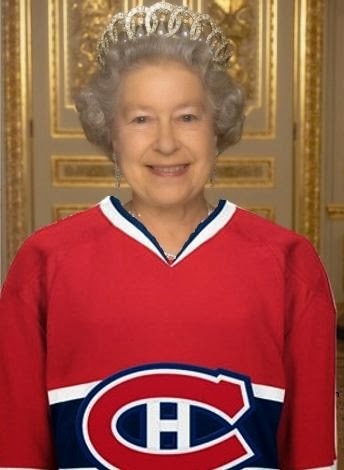 And doesn’t The Queen look good as a Hab’s fan! It was the early 1970’s and the Toronto Maple Leafs were under the control of Harold Ballard. I was in my early teens and with all the turmoil and lost games my interest turned to Montreal. The team was fast, had great leadership in Scotty Bowman and they were fun to watch. I’ve never looked back…and while I’ve tried to be a loyal fan of teams where we’ve lived (Ottawa and Calgary especially) my interest in The Habs hasn’t waned. So imagine how excited I was to discover Her Majesty also was a fan! A royal treat it is!